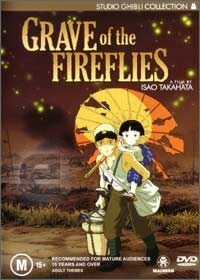 Grave of the Fireflies follows two children, Seita and Setsuko, left orphaned during World War 2. Thinking the worst is over they soon learn they must survive on their own, in a time when everyone is out for themselves. The film is based on the real life experience of author Akiyuki Nosaka which makes the events depicted so much realer and poignant. Grave of the Fireflies is not a film that could be described as feel good entertainment, quite the opposite, it is very dark and depressing – and yet it contains a warm heart and spirit. The relationship between Seita and Setsuko is the cornerstone of the film. Seita’s desire to protect his little sister from their harsh reality is heartbreaking, made even more so because he knows they may not make it despite his best efforts. The indifference displayed by the children’s fellow countrymen is subtle at first, their carer giving them less rice than her daughter and border, before blossoming into an unimaginable harshness – it is a wonder that people could treat each other, let alone children, this way. The animation is at times spectacular, the backgrounds are beautiful, and the characters appear very lifelike – which helps when dealing with such human emotion as the story does. Despite Grave of the Fireflies being animated it is not for children, who would no doubt find it very hard to watch as it can be quite graphic in its depiction of war, disease and death. Grave of the Fireflies is not a film for everyone, but those that do view it will find themselves both touched and haunted. The two disc set is packed with special features include interviews with director Isao Takahata and author Akiyuki Nosaka, a documentary on the restoration of the film’s video and an historical perspective with commentary. Also included is an alternative storyboard angle for the whole film, an art gallery, biographies on the author and director, DVD content, trailers and much more.